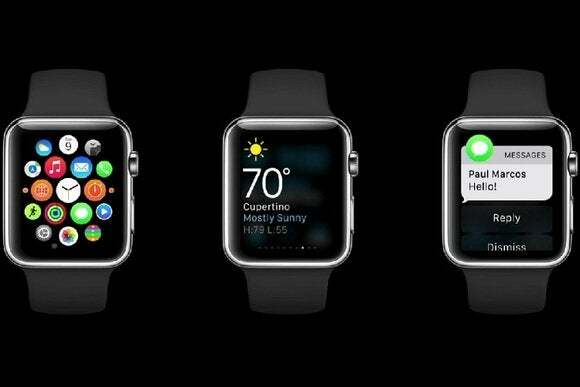 With the launch of WatchKit for app developers, Apple has revealed a few more details on how the Apple Watch will work. WatchKit is the framework that developers will use to create Apple Watch apps. It's available now to developers as part of the iOS 8.2 SDK beta, along with new design guidelines that demonstrate how Watch apps should behave. In its release announcement, Apple names ESPN, Instagram and American Airlines as early partners. The developer guidelines also reveal new details on the hardware itself. Why this matters: Apple left a lot of questions unanswered when it announced the Apple Watch in September, particularly on the topic of third-party apps. The new guidelines give a much better sense of what it will be like to use the Apple Watch once app developers get on board. “Glances” provide quick looks at things like sports scores, stocks and weather. They're non-interactive and must be confined to a single screen, so that users can swipe between Glances from different apps. However, tapping on a Glance can open a full watch app if it exists. Notifications on the Apple Watch borrow heavily from interactive notifications in iOS 8, letting users take action on emails, social media mentions and other notifications without opening the app itself. Notifications will initially appear in a “short look” preview mode, and they'll go away if the user lowers his or her wrist. More details and interactive options will appear if the user taps on the notification or leaves his or her wrist up. Full-blown apps allow for deeper interactions as needed. For example, users could open a to-do app to view and dismiss tasks, or open a music app to control playback. One other important note: At launch, all Watch apps will require a paired phone to operate. Apple says fully native Watch apps will be available later in the year. The design guidelines also reveal a screen resolution of 340x272 pixels for the 38mm Watch, and 390x312 pixels for the 42mm watch. Apple says that apps should display the same content for both sizes. Apple hasn't given a firm release date or full pricing for the Watch, but the basic model will cost $350, and a spring launch seems likely. Developers should have at least a few months, and probably more, to start building their apps.